If you haven’t noticed, I went on holiday to Italy recently – although if you follow me on Instagram it’d be impossible not to know! 😉 Our villa (read about it here) was perfectly located and was close in distance from both Pisa and Florence so it provided us with a perfect base for exploring the surrounding area. Oh, and if you haven’t taken a look at Clickstay yet now is the perfect chance to as I’ve managed to nab a unique discount code for £50 of ALL bookings of £500+, simply enter HelloCuppies at the checkout. Beat the winter blues and have something to look forward to! It’s what keeps me going. We actually visited the very first day of our holiday. I’d been told by quite a few people that after seeing the tower there isn’t actually a lot more to do so assumed we’d be there a couple of hours then we could move on to somewhere else. I cannot remember a time when I didn’t know what The Leaning Tower of Pisa was, everyone is aware of it but until you see it with its highest point set twelve feet off its vertical, the ‘lean’ really takes your breath away in person. It really exceeds expectations! Everything gleams. The church, the bell tower. It’s all limestone structures coated in white marble and it’s stunning. For you clever-cloggs that already know why the tower tilts this next sentence isn’t for you 😉 But, if like me, you have no idea why it tilts then here it is; when construction started in 1173 the ground was too soft on one side of the site, and this soft foundation caused the building to start slowly sinking as soon as the workers began constructing the second story — this is why the building tilts – you learn something new every day! Hands up who else thinks it looks a bit tiered cake-like? Everywhere I go I think of cake!! Just me? Located in the ‘Piazza dei Miracoli’ (Square of Miracles) along with the stunning cathedral, baptistery and cemetery, which together make up one of the finest architectural complexes in the world. Before visiting Pisa I had no idea that the leaning tower is just one of the many stunning buildings here and the stunning cathedral is well worth a visit. We actually bought a ticket for €18 which gave access to both. Naively I hadn’t even realised you could climb to the top of the tower so guess what we did… we climbed to the top, all 284 steps, a ‘tall-order‘ in itself but it was a ‘pisa-cake’ really. (puns totally intended)! Strangely, as you’re climbing you can feel the lean and it made us feel ever so slightly disorientated. Nothing major and all worth it just for this view. Take a bottle of water around with you. Even if it’s empty, you can fill it up at the water fountain and it’ll help you catch your breath when you reach the top. I love this photo of my Mum and brothers even if they do think it looks like some kind of dodgy ad for a crime/thriller TV programme – that made me laugh. Wave at the people at the bottom. I guarantee they’ll wave back. Next stop, we ventured over to the Cathedral which is actually one of the most ornate and indeed amongst the most impressive Cathedrals you will see in Italy! No one ever really tells you this but it is so beautiful inside. Just look at the gold ceiling! Even if you’re not into churches and architecture you’ll still be in awe. We carried on wandering the Square of Miracles, savoured the architecture, and people-watched and fell into hysterics over the photo attempts to support the infamous structure. Part of the fun is watching people trying to make some new pose by kicking, holding, pushing the Tower! You name it, they’ll try it! "(AD) A Day in Lucca & Dinner at Villa Cerine"
"Falling in Love with Florence"
That view you got made it all worth it. I also love your tip about the water. I too am queen of refilling my water bottles when I travel. Buying new water can really add up! Love these pictures, it really makes me want to visit. The cathedral architecture is so stunning and breathtaking. I am going to put this on my bucket list. Love seeing those pictures. The cathedral is so stunning and awesome. I will definitely put this on my bucket list for my future next travel visit. Architecture is very beautiful and delicate. I have a weekend with my family, Pisa is a place to choose. First this place looks AMAZING! I have friends who are there now and loving it! Also I’m kinda obsessed with you “Pisa Puns”! A good pun in never not funny! I loved Pisa so much. Such an amazing place, full of wonderful history! Oh wow Pisa looks amazing . I would love to visit here. I am definitely adding this place to my list of places to visit. I loved Pisa so much! We went there for a wedding about 6 years ago, and I loved everything about the city. We stumbled upon a fresh little market and I had real coconut for the first time ever. It was amazing. ooh I love coconut! It’s refreshing too. Pisa is so beautiful! I love all of the architecture and the history behind it! Italy has been on my must see list for so long! Next year for sure. Crazy you can feel the lean on the way up. Anything Italy I’m in haha. Pisa is amazingly beautiful and its architecture is also breathtaking. What a spectacular view you had ! I loved the pic of your family as well! It is so important to save memories like this! Thanks for sharing! It was a pis a cake! Lol Love it. Limestone always makes for some of the more gorgeous architecture. Anywhere in Italy would suit me well to visit, but I will definitely have to put Pisa on in my list! Pisa is on my bucket list! I hope to see the leaning tower someday with my own eyes! Your pictures speak for itself how beautiful it is! It looks like a fun experience and such a beautiful place in Italy. The cathedral is really stunning, great architecture!! If I ever had a chance to visit Italy again I will absolutely visit Pisa. Your photos are amazing! I really love the gold ceiling and the beautiful architecture. Italy is beautiful! Me too, the gold ceilings are just incredible! 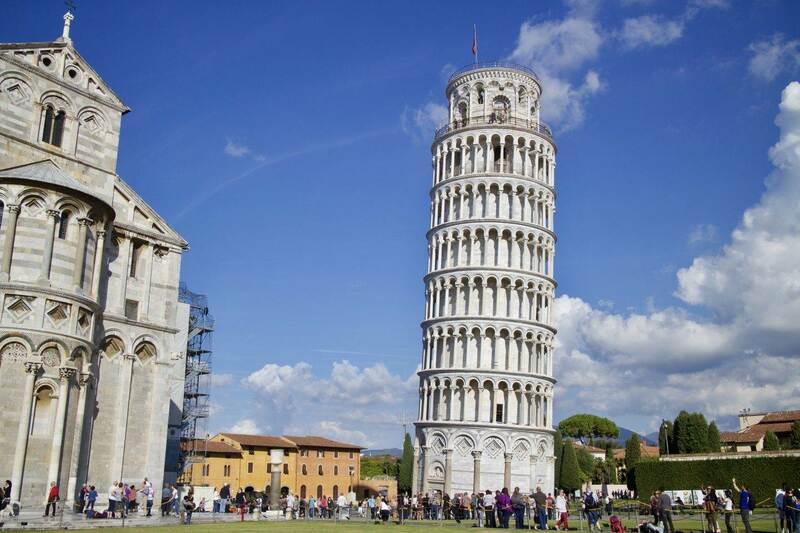 I’ve been to Pisa once, such a lovely place and Italy is…. you know, Italy! Love Italy. I loved your photos and your in the Cathedral, they brought back sweet memories. I am actually going to Pisa this evening and I will be going to the square to look (and laugh) and the people posing with the tower. 🙂 This area of Italy is so beautiful, I can’t get enough of it.